They hide out all winter, beneath rocky hillsides, under meadows, and along the sides of gravel roads. They're there, but you can't see them. A riot waiting to happen -- and their time is now: Wildflowers. California's unique combination of rugged geology and a dry Mediterranean climate make it ideal for annual spring wildflower explosions. Most of the state's floral bounty blooms from late March through early May. A wet winter followed by a mild spring are ideal for producing the best color displays, so now's the time to put on your hiking boots and head for the hills. Just consider it nature's reward for surviving the cold and gray. But don't wait too long -- California's dazzling wildflower palette peaks in mid-April, and then fades away into a brown tangle by early summer, dropping its seeds for the long months of waiting that lie ahead. California's reputation for spring wildflowers goes back two centuries. When the first Spanish galleons sailed up and down the coast in the 18th century, the early mariners took note of the deep orange swath cut by the state's famous poppies against the verdant spring hillsides, so they dubbed it the "land of fire." One hundred years later, in April of 1868, an enchanted John Muir, at the end of his famous Thousand-Mile Walk, wrote that the "valley of the San Joaquin is the floweriest piece of world I ever walked, one vast, level even flower-bed, a sheet of flowers, a smooth sea." Much of what the famed naturalist once observed is now lost beneath miles of cities and farms, but even today, 132 years and 35 million people later, the wilds of California still explode into a carpet of color. BEAR VALLEY RD: The Jewel in the Crown Stem and shoulders above every wildflower display in Northern California is Bear Valley, located west of the farming town of Williams in Colusa County. Deep in the Coast Range that separates the Sacramento Valley from the narrow inland valleys, remote Bear Valley, boasts one of the most dazzling wildflower displays in the world. Partly owned by the American Land Conservancy, it features wildflowers, many quite rare, that were once common in California's intercoastal valleys and ranges. The glory of any western wildflower display, is the California poppy. "This flower is now cultivated in many parts of the world," wrote naturalist Mary Elizabeth Parsons over a century ago, but "one must go to its native hillsides to get any idea of its prodigal beauty." And the hills and meadows of Bear Valley deliver on that promise. Fairly brimming over with the flower's orange cups, Bear Valley's poppies permit other wildflowers, such as Yellow Tidytips and the blue Royal Lupine, to stand out in greater contrast against its own golden carpet. Even as you enter Bear Valley, you get a hint of what's in store. Light pink cat's ears, (Calochortus uniflorus) line the dusty road near the main bridge, and once inside, the valley floor and slopes fairly blaze in a Technicolor mix of Purple Owl's Clover, Foothill Penstemon, and Blue Dicks. Wildflower lovers and photographers should keep an eye out for the rare pink Adobe Lilies, which start blooming in late March. Other than the 14,964 acres owned by the ALC, much of the valley is still in private hands. The road into Bear Valley can be pretty rugged -- there are spots that are either unpaved or thinly paved -- since most of the area is still working ranchland, but the coat of dirt you'll get on your car is worth the trouble. HOW TO GET THERE: From the Bay Area, take Insterstate 5 north to Williams, then drive 18 miles west on State Highway 20, then exit right and go north on Bear Valley Rd. 14 miles. 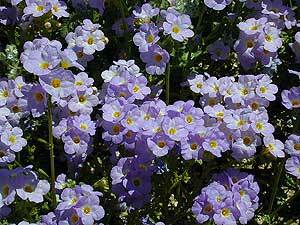 INFORMATION: Wildflower tours given by the ranching Keegan family are offered through April. Call 707-998-4471 for current costs and additional information. 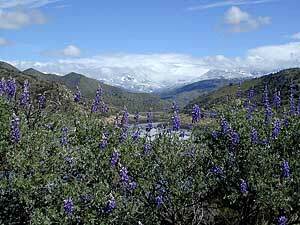 The ALC also publishes a Bear Valley Field Guide, and maintains a Bear Valley Wildflower hotline (415) 403-3850. It's always best to call because late spring rains can occasional block or wash out the road into the valley. THE EAST BAY: If you're in the Bay Area, the hills of rural Alameda and Contra Costa counties make for spectacular wildflower viewing in the East Bay. Black Diamond Mines Regional Preserve, near Antioch, and Morgan Territory Regional Preserve just north of Livermore skirt the base of the north and south sides of Mount Diablo (itself a state park) and are easily accessible from freeways. BLACK DIAMOND REGIONAL PRESERVE: In the late 19th century, California's coal mining industry thrived in the Contra Costa County towns of Nortonville, Simonville and Somersville. Tons of soft coal were mined by hardy Welsh immigrants to supply both bustling San Francisco and the coal-burning steamships that chugged up and down the Pacific Coast. Today, the towns have vanished, leaving behind only cemeteries and miles of abandoned tunnels as proof of their existence. All are preserved in the East Bay Regional Park District's Black Diamond Mines Regional Preserve. Black Diamond offers two loop trails. The Nortonville Trail brings you to the Rose Hill Cemetery, where century-old tombstones mix with tall grasses, California poppies and purple lupines. A southward trip on the Black Diamond Trail, which links with the Manhattan Canyon Trail features spectacular ridge vistas of the surrounding hills, dotted with oaks and blanketed in wildflowers. HOW TO GET THERE: From Interstate 680, which runs from San Jose to Martinez, take State Highway 4 to Antioch and exit at Somersville Rd., south exit. Follow the road to the park's entrance. For park hours and information call (925) 757-2620. MORGAN TERRITORY REGIONAL PRESERVE: In addition to wildflowers, spectacular vistas of the Livermore Valley, Mount Diablo and glimpses of the San Joaquin Valley beyond, are why wildflower enthusiasts give this lesser-known park high marks. From its almost 40 miles of trails, color seekers can find the scarlet monkey flower, tidy tips, and the obligatory mix of poppies and lupines, among many others, in their full spring glory. The Volvon Trail loop, meanders through the center of Morgan Territory. Take the Coyote Trail from the parking lot, and then follow the Condor Trail until it links up with the Volvon Trail, where the wildflowers begin. The Prairie Falcon Trail leads you through oak woodland and open grazing land, then take the Blue Oak Trail back to the parking lot. HOW TO GET THERE: From Oakland, take Interstate 580 east (or from Interstate 5, take I-580 west) to N. Livermore Avenue. Follow the road north to Morgan Territory Rd. For park hours and information call (925) 757-2620. Many orchards can be found in bloom in the Central Valley March thru April each year. Visalia groves, all the way to the wildflowers at the Sierra foothills.